An estimated 50,000 Nicaraguans fled to exile in Costa Rica over the last year, and many are struggling even as their fate is a key point in peace talks back home. SAN JOSE, Costa Rica (AP) — Back in Nicaragua, she owned her own home and made enough as an elementary substitute teacher and lawyers’ assistant to eke out a stable, if not luxurious, life. 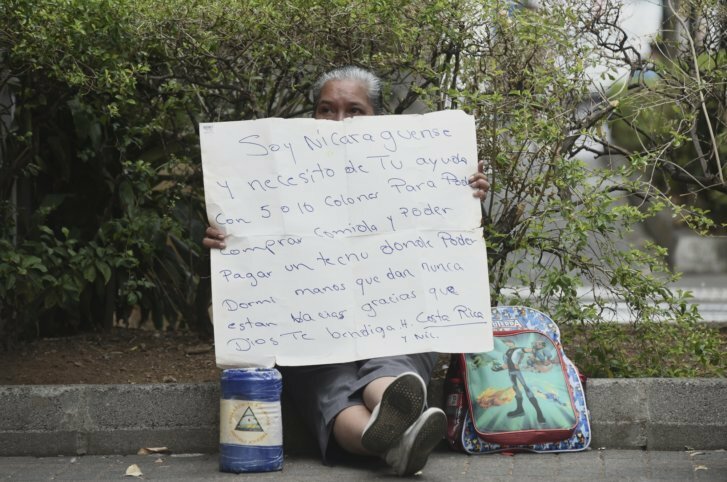 Now she spends her days on the streets in and around Costa Rica’s capital begging for spare change and clutching a can decorated with Nicaragua’s blue-and-white flag, an unmistakable reminder to pedestrians of the political turbulence that has claimed hundreds of lives in her native country. The fate of the estimated 50,000 Nicaraguans who’ve fled violence and persecution for exile in Costa Rica over the last year is a central point in fledgling peace talks between Nicaraguan President Daniel Ortega’s government and the opposition, which is demanding guarantees for their safe return. But while negotiators in Managua haggle over that and other thorny issues with little progress, many exiles are struggling. Some formerly middle-class citizens are having trouble putting food on the table and keeping a roof over their heads, while others from the working class are reduced to living in near-indigence. The most vulnerable among them have become “the forgotten among the forgotten,” said Esteban Beltran of Amnesty International Spain, who recently visited Costa Rica to document their plight. Like many others, the teacher fled during the so-called Operation Cleanup launched by Ortega last July, which the United Nations has termed a “witch hunt” aimed at suppressing dissent. In her hometown of Diriamba, paramilitary forces aligned with Ortega’s government left a trail of dead and wounded, she said. The only thing to do was run. Like many exiles she ended up in La Carpio, a shantytown on the outskirts of the Costa Rican capital, San Jose, where the number of Nicaraguans has swelled since the protests began last April, though nobody’s sure by how much. It’s a neighborhood of cement and sheet-metal homes where sleeping quarters and a latrine often occupy a single space. Water is scarce, trash piles up in the streets and sewage flows in open channels. Even before the latest influx of Nicaraguan refugees, half of the estimated 18,000 people in the neighborhood lived in inadequate homes and 70 percent of households subsisted on less than $330 per month, according to a government study last year. The $3 that the teacher is able to beg on a bad day isn’t nearly enough and like others she relies heavily on aid from churches and help from neighbors who are in equally precarious situations. Still lacking a work permit after eight months, she’s sleeping on the floor of a rented, 300-square-foot (30-square-meter) house along with her two adult children, two grandchildren and six others from another family. On a recent day the only things in the pantry were a packet of pasta, a Nicaraguan flag and a Bible. While asylum-seekers are guaranteed the right to work, the sheer number of Nicaraguans has overwhelmed Costa Rica’s system for processing such requests. Authorities are able to handle only about 600 asylum applications per week, and securing work permits involves yet another bureaucratic hurdle. So far only 8,000 have secured work permits compared with the nearly 29,000 who have received credentials as asylum-seekers. More than 20,000 are awaiting appointments. Last week Amnesty urged the Costa Rican government to put an aid plan in place for Nicaraguan refugees with help from the international community, including identifying the most vulnerable and fast-tracking access to basic services they have a right to and may not be aware of. Costa Rica’s government said the plan is ready and simply awaiting presidential sign-off. Ortega’s government did not respond to a request for comment. Ortega officials have had little to say about exiles, though in a recent speech the president compared all opposition supporters to Cain, the biblical figure who killed his brother Abel out of envy. Peace talks between Ortega’s government and the opposition Civic Alliance began Feb. 27, but progress has come in fits and starts. The government has freed more than 160 jailed government opponents to house arrest, but hundreds more remain behind bars under a slow release plan that’s supposed to take place over 90 days. On Friday the government and the opposition reached two accords, one of which supposedly restored the right to demonstrate freely — only for police to forcefully break up a protest the following day during which an apparent government sympathizer shot at demonstrators who sought refuge in a mall. Recently the government also emphatically rejected calls for early elections scheduled for 2021, another central opposition demand. “In Nicaragua we say about Ortega, ‘You may sign, but you’ll never follow through,'” said Cesar Gutierrez, 63. Gutierrez is a regular at gatherings where he and fellow exiles plan demonstrations, coordinate with government opponents back in Nicaragua, share news of home gleaned from the internet and gossip about the latest from the talks. He said he’ll believe Ortega is acting in good faith only when all prisoners are released and freedoms of speech and assembly are restored — two other core Civic Alliance demands, along with the annulment of trials, convictions and arrest warrants for government opponents. Gutierrez, a former fighter in the revolution that first brought Ortega to power in 1979, later soured on the president, joined the protests and fled after receiving threats against his life and home. He, too, is living in La Carpio, taken in by a family friend who is letting him sleep in the living room of her modest home where seven others also live. He scrapes by selling homemade cheese to fellow exiles after leaving his family back home and his businesses, a bakery and some billiard halls. At least 168 Nicaraguan exiles are wanted due to their political activities, opposition leaders say. Among them is Sadie Rivas, who slipped across the border in August after being accused of a laundry list of crimes more associated with a narco-kingpin than a 19-year-old college student: torture, terrorism, money laundering, drug trafficking, weapons possession, destruction of public property, disturbing the peace. Such accusations are typical in cases against protesters, and both they and international observers call them groundless. Rivas’ father and brother remain in hiding in Nicaragua, moving from safe house to safe house. Her mother joined her in San Jose after being targeted for arrest for sheltering and feeding her daughter — “covering for terrorists,” as the government charges. An artist who made artisanal soaps and jewelry back home, Rivas and her mother now clean houses and wait tables. Like Gutierrez they’re fortunate enough not to be living in slum conditions, but it’s not the life they’re used to. Rivas plans to return but thinks opposition negotiators at the talks need to be more aggressive. Verza reported from Mexico City. Associated Press writers Carlos Gonzalez and Javier Cordoba in San Jose, Costa Rica, and Gabriela Selser in Managua, Nicaragua, contributed to this report.